In this article we will show you, How to write a C Program to Print Rectangle Star Pattern with example. And also show you, How to print Rectangle pattern with different symbols. 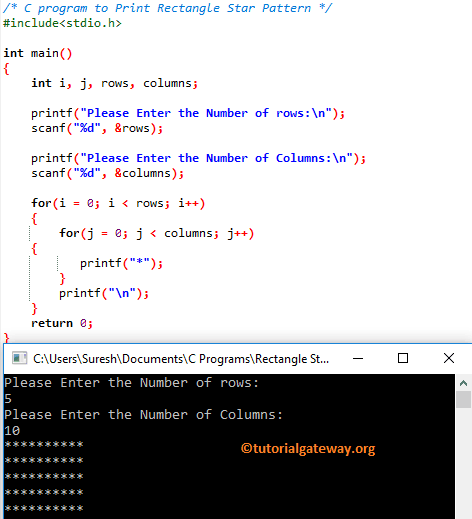 This C program allows the user to enter the number of rows, and columns to design rectangle. These values will decide the number of rows, and columns of a rectangle. Here, we are going to print the stars until it reaches to the user specified rows, and columns. This will happen until it reaches to 10 and after that both the Inner Loop and Outer loop will be terminated. This C program allows the user to enter the Symbol that he/she want to print as rectangle pattern.